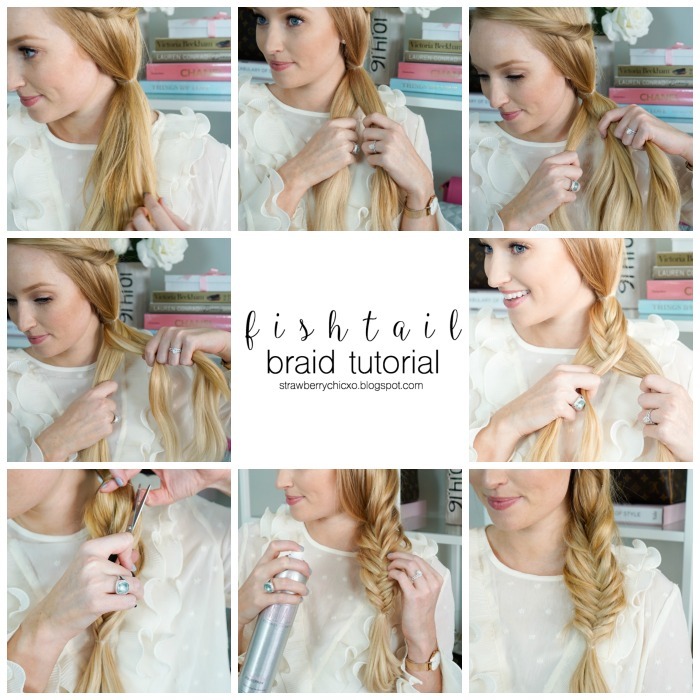 Here is a simple step-by-step tutorial on how to do a messy fishtail braid on yourself. I used to save braids for the beach, but lately I’ve had a lot of fun experimenting with different braids to mix up my typical soft curled hairstyle. I like to twist my “bangs” and pin them back to keep them in place during the day. I just twist a small section and pin it with a bobby pin. I don’t typically do this step anymore, but I think if you’re just starting out this step makes it easier to start the fishtail braid. 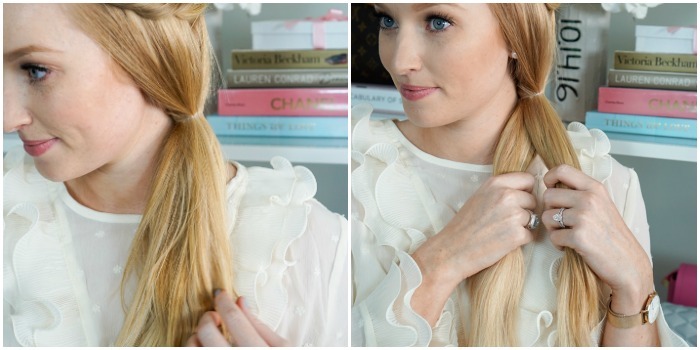 Use an extra clear elastic at the top to help keep your hair together as you learn the braid. You will cut this at the end when the fishtail braid is complete. Then separate your hair into two equal sections. Grab a thin piece of hair from the outside of section one, then cross it over to section two. I prefer to use smaller sections even though it will take a little bit more time. 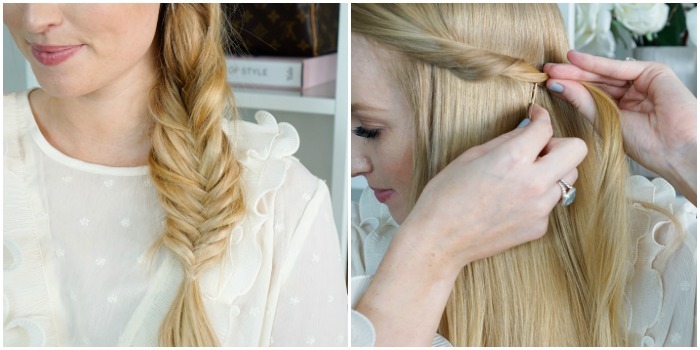 It adds more dimension and texture to the braid. Repeat that step by grabbing an outside piece from section two and cross it over to section one. I like to tighten the braid between each section as I go. You’ll repeat this crossing technique until you’re happy with the length of the braid. 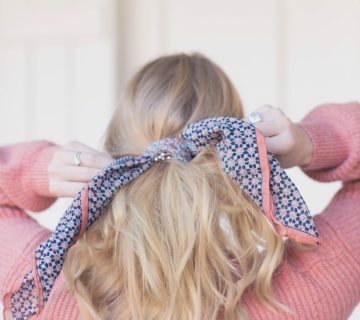 Secure the end with a clear elastic hair tie. 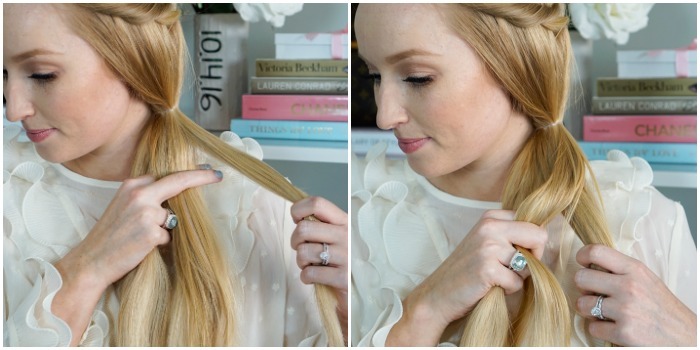 Pull and separate the length of the braid until your desired messiness is achieved. Then tighten the end of the brain by dividing it into two sections and pulling them apart. This will make the ends look a little thicker. Carefully cut the top clear elastic, then finish with hairspray. 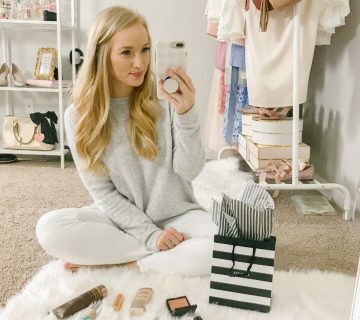 If you have layered hair, you will need to use bobby pins to tuck in little flyaways into the braid (see how in the video below). Curls the ends of your hair if desired, but be careful to avoid touching the elastic band. I’ve learned from experience theses will easily break if they touch the hot tool! I also like to curl a piece in the front on the side opposite of the braid to add some balance to the look. I also filmed a video if you want to watch the step by step process below. If you’re looking for my ruffled top, it’s currently sold out. I’ll keep my eyes peeled for a re-stock and if you come across one in stock definitely size up! oh, totally saving this! i need to learn this!! SUCH A GOOD TUTORIAL! 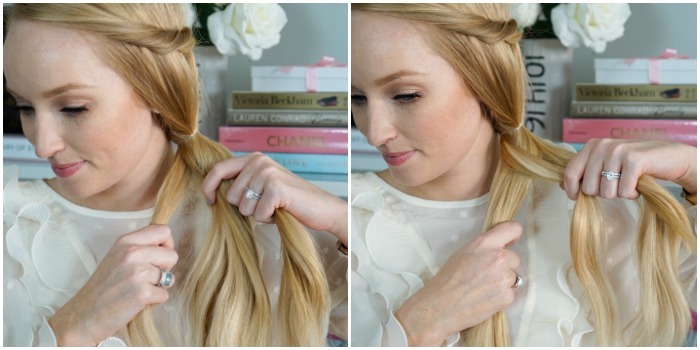 Love this braid – now if my hair would just grow long enough so I could do it to my own hair! I'm wearing extensions! My hair will NOT grow after trying for yearsssss. Thanks Rachel! 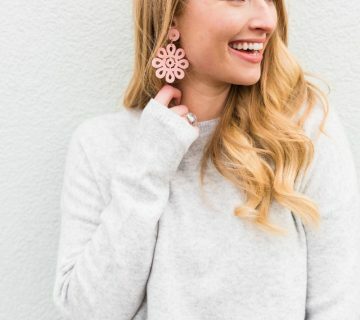 I wish my hair was long enough to do this style- it's so cute!!! 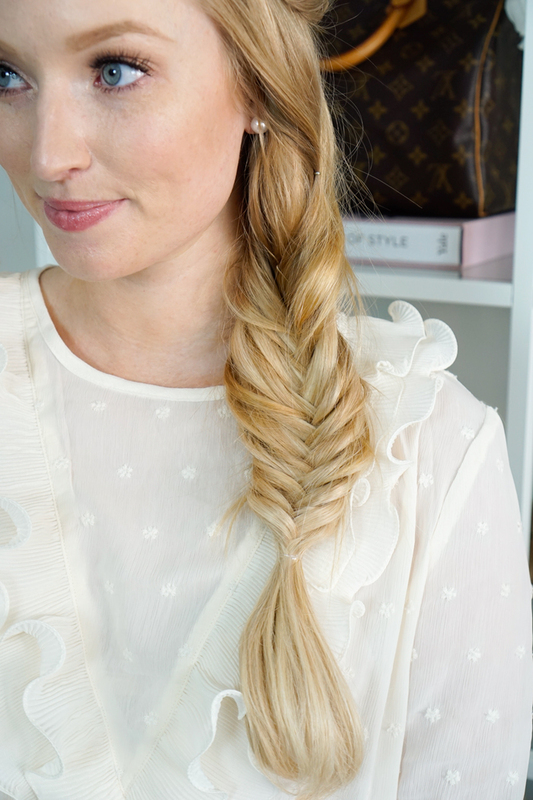 I've always wanted to conquer the fishtrail braid. This is such a good tutorial! 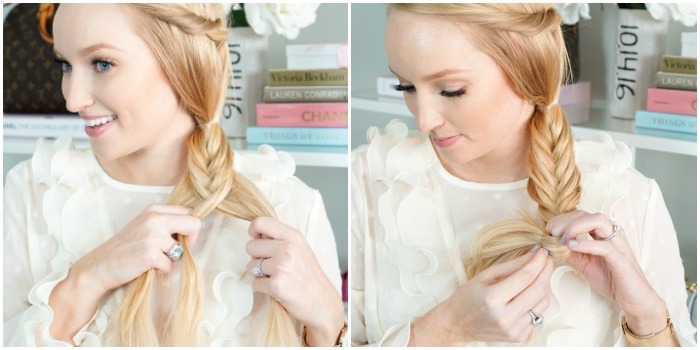 We have always wanted to wear this style of braid!! Thank you so much for the great tutorial! Your hair looks so pretty! Thanks babes! 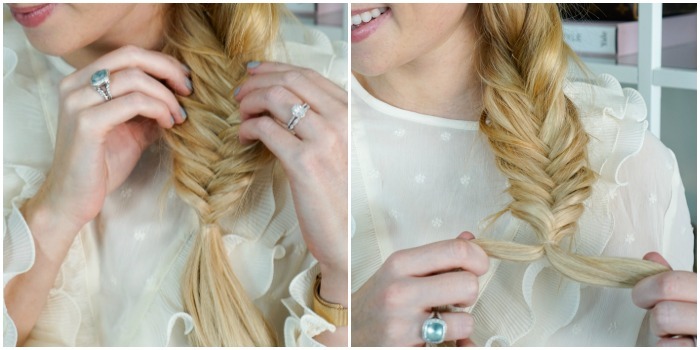 Y'all would definitely rock the fishtail braid! I'm definitely a beginner when it comes to hairstyles .. really enjoyed this tutorial and the step-by-step guide! I'm a visual learner and this was so helpful! Bookmarking this! Such a pretty braid! I loveeee a good fishtail! Looks so pretty! Extensions are a girls best friend! I need to get this hair extension thing!!! Loved this braid on you at the Phipps event.